Wear Pinoy. Take a sip. Strike a pose! 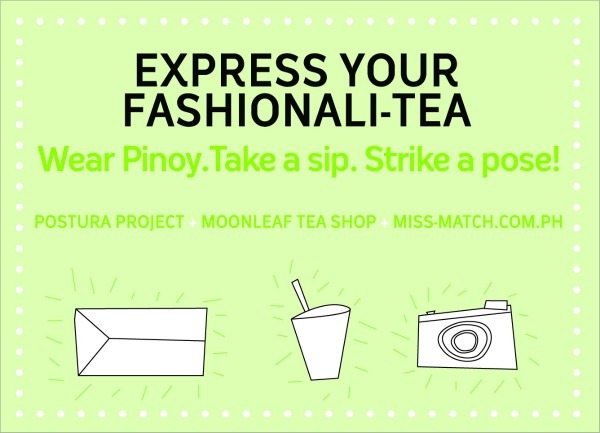 To introduce miss-match’s new Style Gallery, and with a shared mission to uphold Postura Project’s spirit of “fashionalism,” we have come together to create a style spotting promo called “Express Your Fashionali-Tea,” to be held at Moonleaf Tea Shop branches nationwide. With this fab, exciting promo, we hope to encourage today’s trendsetters to wear Pinoy, actively support local brands, and inspire others with their style—and win cool prizes while they’re at it. 1. Take a photo of yourself wearing at least one local brand and holding your favorite Moonleaf drink. 2. Upload your photo in the Style Gallery on miss-match.com.ph. That’s it! Just remember: Wear Pinoy. Take a Sip. Strike a Pose! Five stylish winners will be chosen each week, and up for grabs are gift certificates from Moonleaf and fashion loot from Postura Project’s partner brands, including Habi, Renegade Folk, The School of Satchel, maryandmaria.com.ph, and Headware. The promo will run from September 8 to October 5, 2012. For more details, please visit the Perks & Promos section on miss-match.com.ph.